At the end of this post I have included recipes for some traditional Italian Easter Pies passed down through my family for generations. Pizza Rustica and Pizza Dolce. (More of an explanation about these pies in the recipe section). 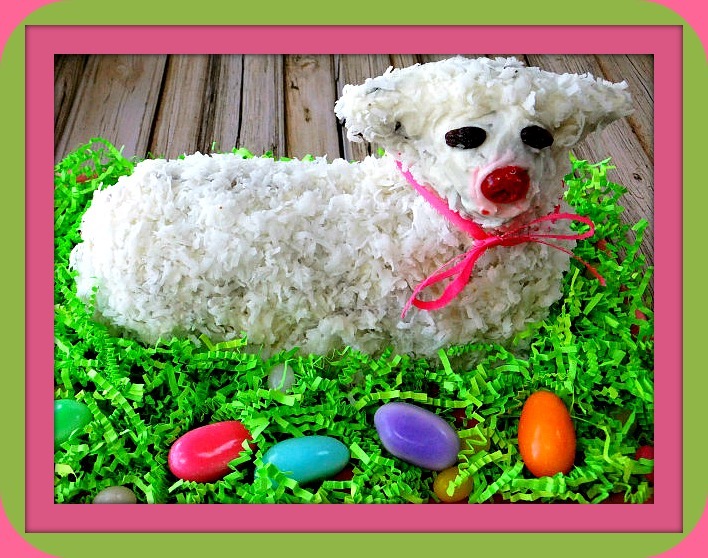 Marie Renello from Proud Italian Cook has been kind enough to share another recipe of hers with us, Easter Lamb Cake – an edible centerpiece. And Paula Carbone Gati from Facebook page, “Born Again Italian” has been kind enough to share another recipe of hers. 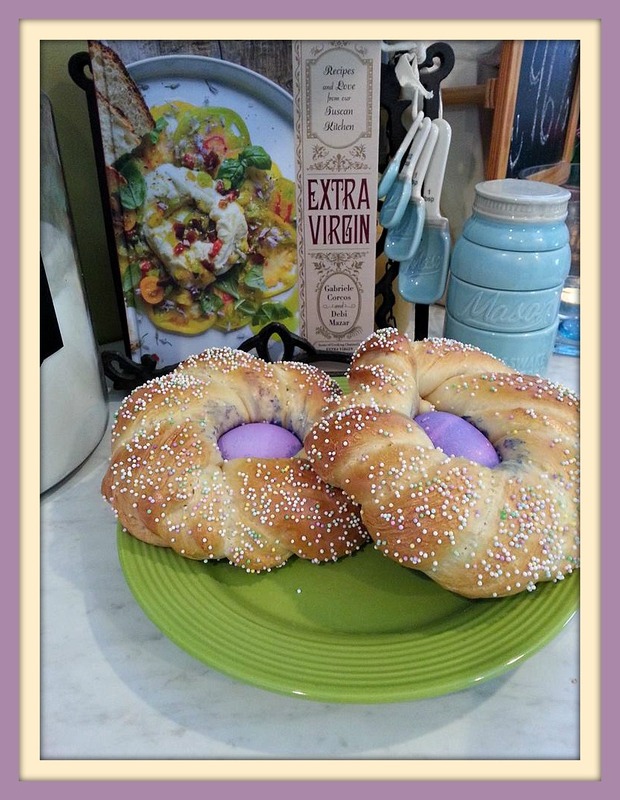 Paula is sharing her recipe for Easter Bread With Colored Easter Eggs. An Italian tradition all the kids love. (Sorry I cannot link to a Facebook page but please visit her page on your own). That marshmallow confection that just can’t be beat ( you have to eat them stale to enhance the flavor. I know I am not alone with this theory). 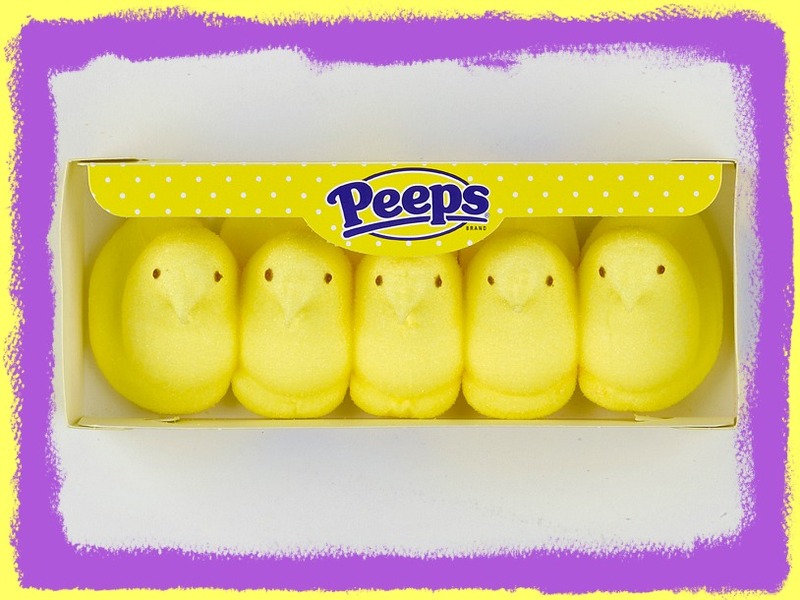 Today they come in all colors, flavors, shapes, sizes, Peeps on a stick, Peeps in a pie, Peeps milk; but there is nothing like an original yellow Peep on Easter morning. This is what I looked for first in my Easter basket as a child. 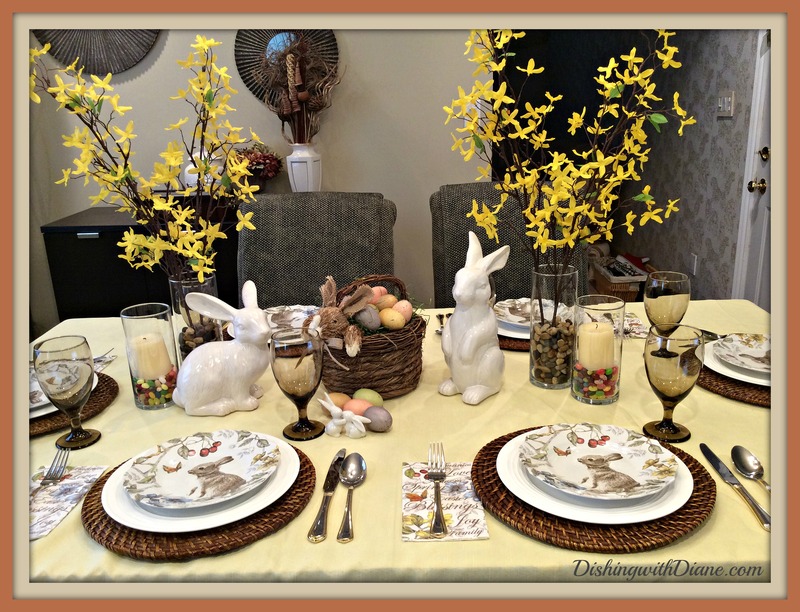 Now on to the Easter Sunday Tablescape. 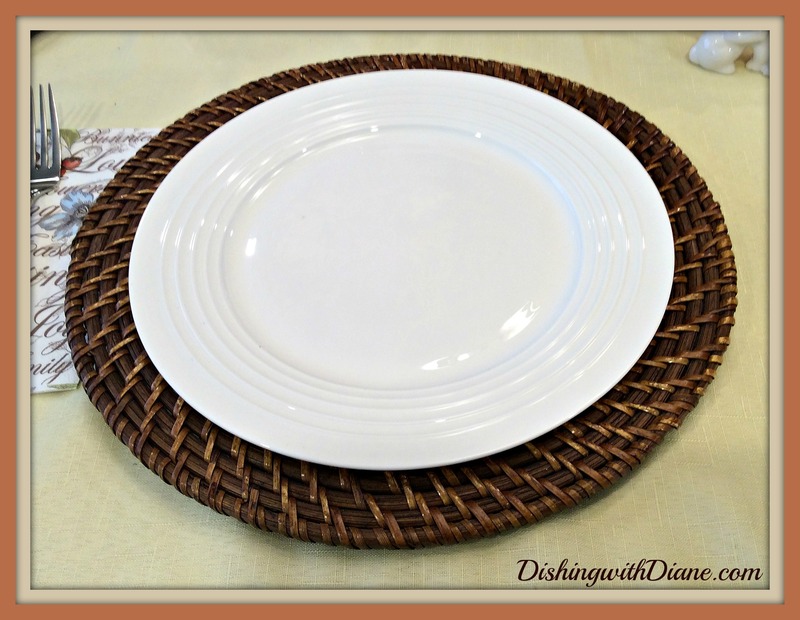 This year I am designing my tablescape around a new salad plate that I just purchased in Pier I. The name of the pattern is “Sophie The Bunny,” and it is absolutely adorable. I fell in love with this plate, (that happens to people who collect dishes). 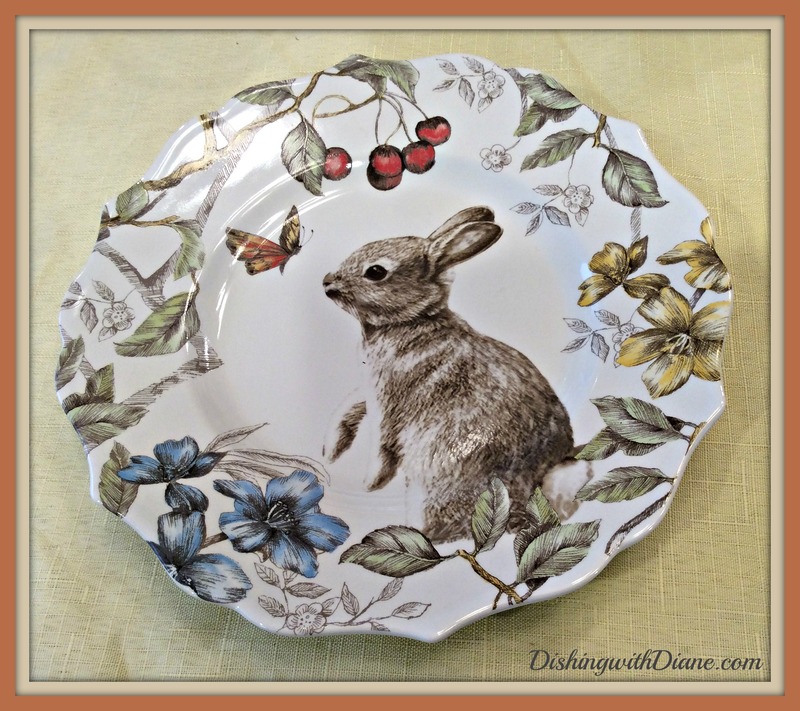 The plate has soft shades of yellow, blue, red, orange and brown and the cutest bunny with flowers and butterflies. 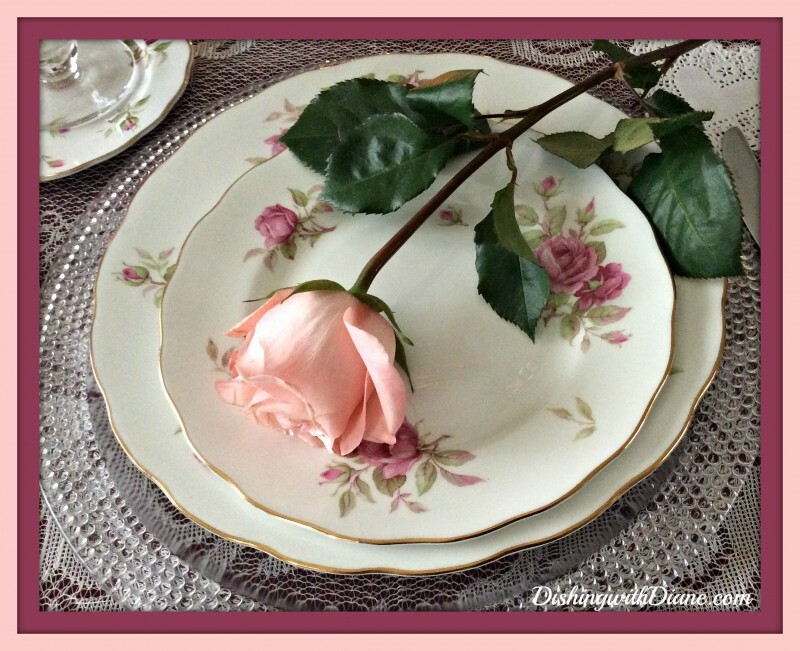 The scalloped edge of the plate is just perfect and delicate. This started me thinking about what else I have that is bunny related and would coordinate with the plate. I have a few bunny items so I had to dig through my collection. 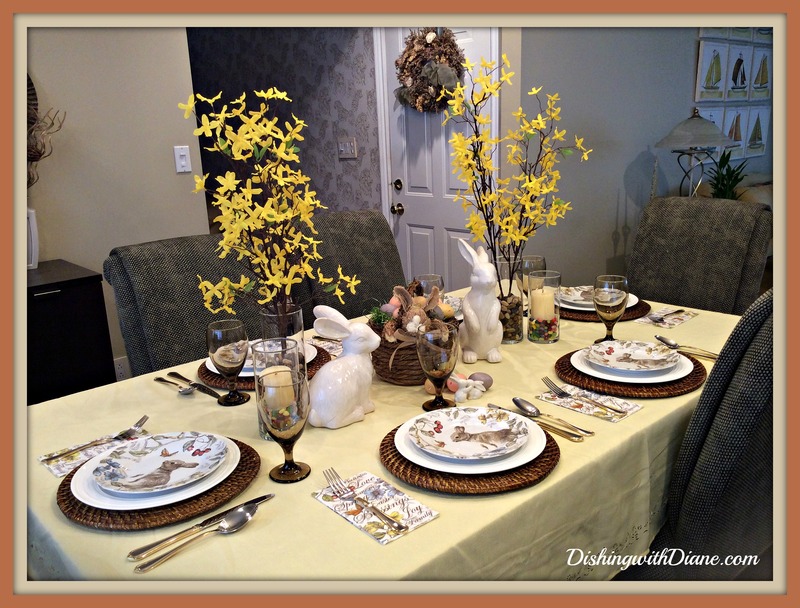 I started this tablescape with a yellow pastel tablecloth. (Something about Easter makes me want to be surrounded in pastel colors). 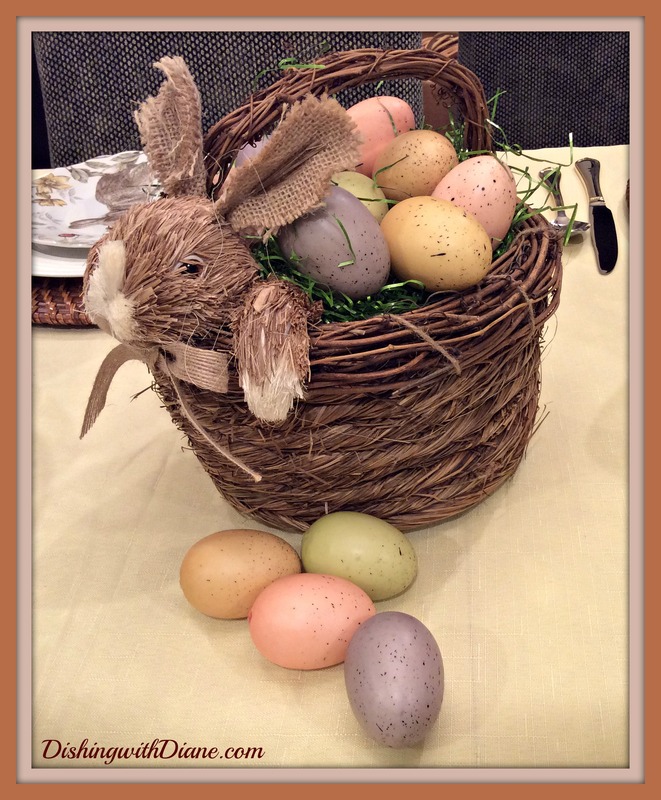 Once I pulled out my straw “Bunny” Basket, I knew I wanted to use that as part of the centerpiece. 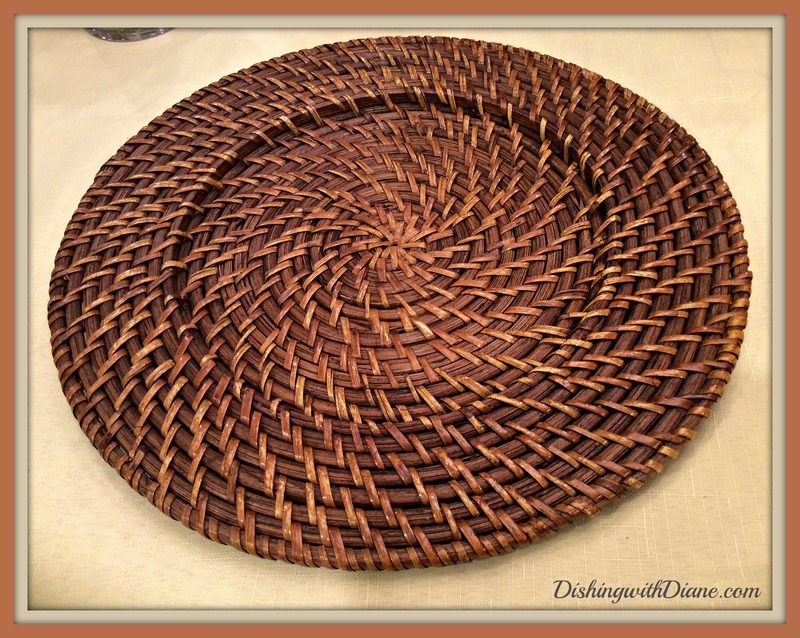 I needed to have that natural earthy look somewhere else on the table, so I chose brown rattan chargers. I love the pattern of the plates so much that I bought the coordinating paper buffet napkins to use instead of the yellow cloth napkins that match the tablecloth. 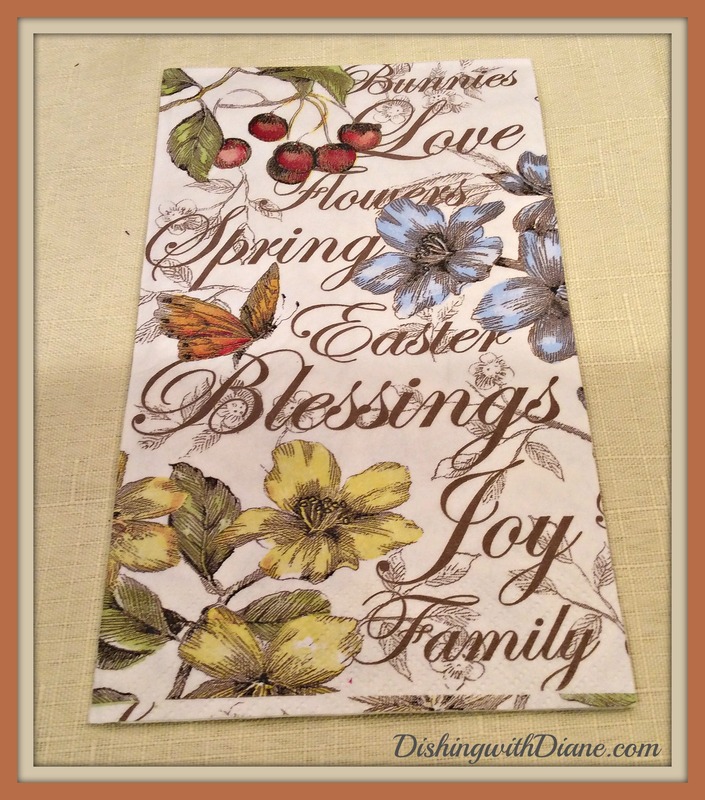 The napkins have the same background pattern as the plate with lovely sentiments written on them. 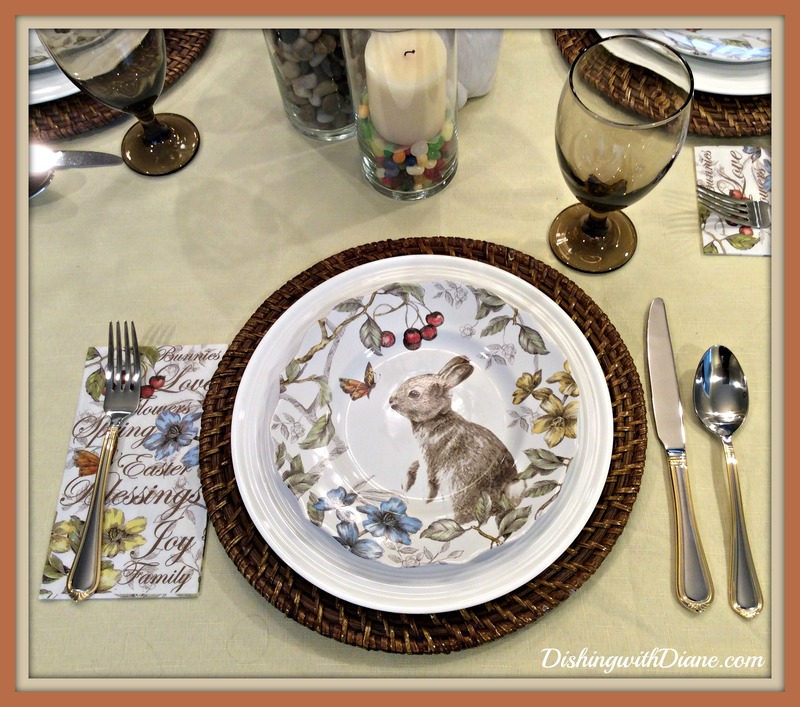 “Sophie The Bunny” had to be the star of this tablescape, so I needed a pretty plain and simple dinner plate. I chose a solid white dinner plate. For my glassware, I am using amber goblets, because the color brings that earthy feel to the table and matches the basket and chargers. The only piece missing is flatware, so I added my silver and gold flatware and we are on to the centerpiece. 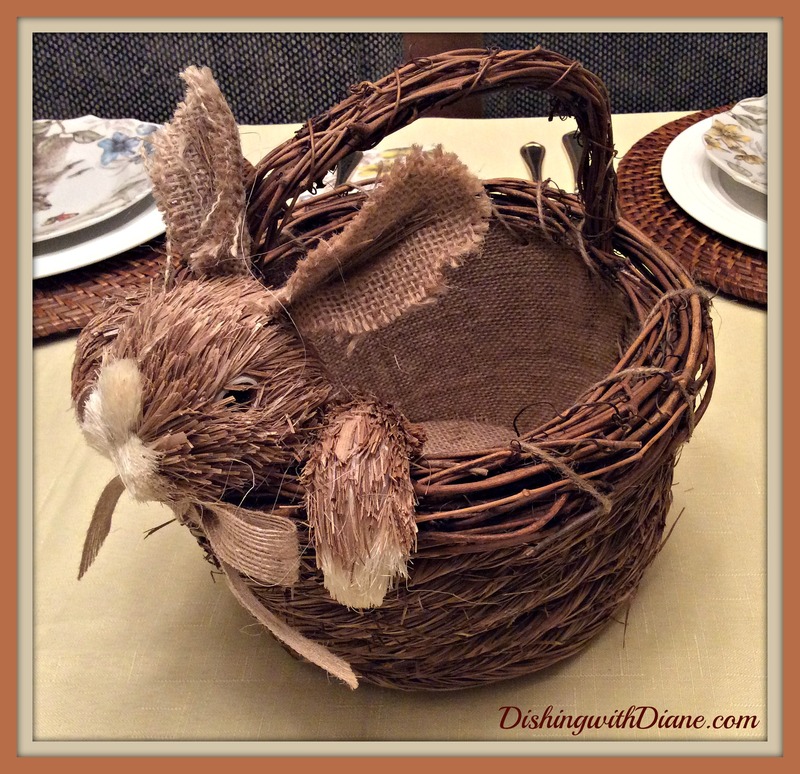 As I mentioned before, I am using my straw Bunny basket; so I filled the basket with newspaper 3/4 of the way and topped that with green metallic Easter grass. 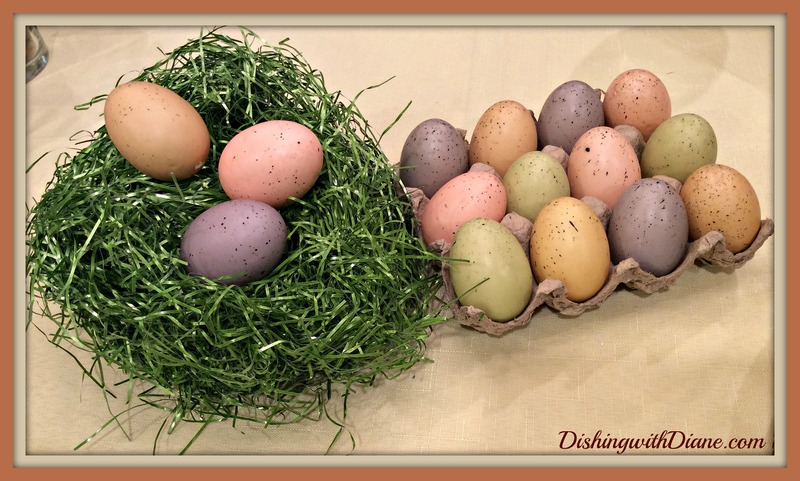 I have a few foam Easter eggs to add to the basket in pastel shades that blend in nicely with the colors of the plate. But the bunnies don’t stop here. 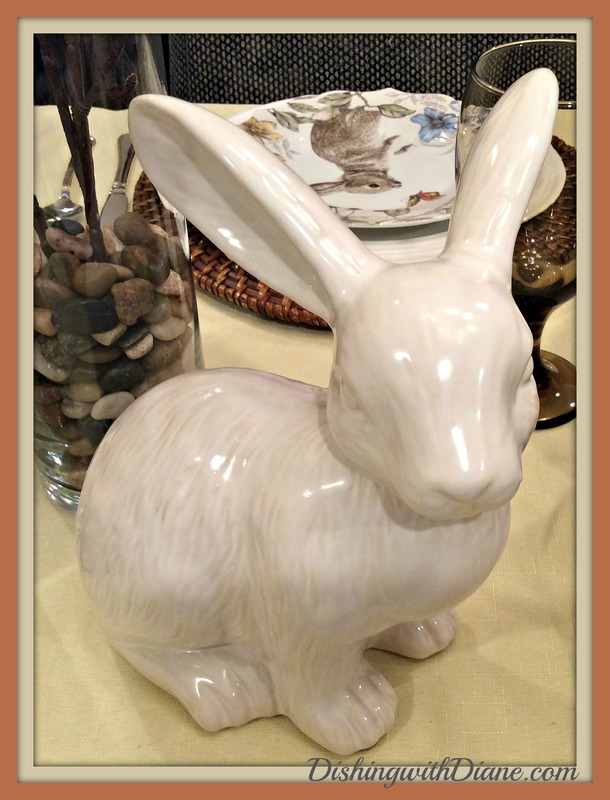 I have white ceramic bunnies that I purchased in Pottery Barn many years ago, and added them to the tablescape. This is such a great decoration that they are on my table every year. 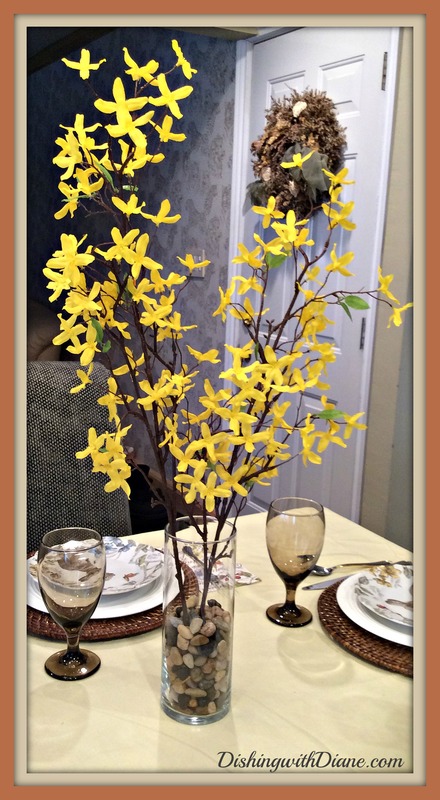 Now I needed some flowers, so I took a clear cylinder vase and filled them with forsythia branches. (Look familiar? I used these cylinder vases in the Spring tablescape with tulips). I wanted a little more of the earthy feel so I added some river stones to the vase. 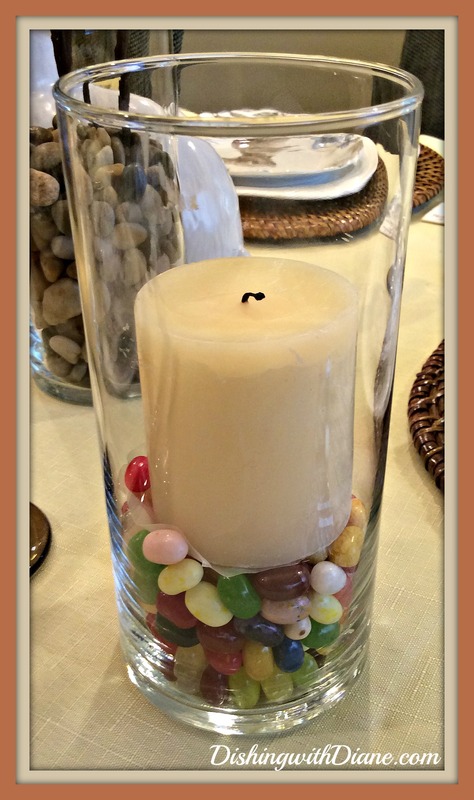 Every Easter table has to have jelly beans somewhere, so I added jelly beans to another smaller cylinder vase and placed a scented candle in the vase. In between the jelly beans and the candle I cut out a cardboard coaster with a piece of parchment paper, so the candle and jelly beans don’t meet (just in case you want to eat the jelly beans after the holiday). 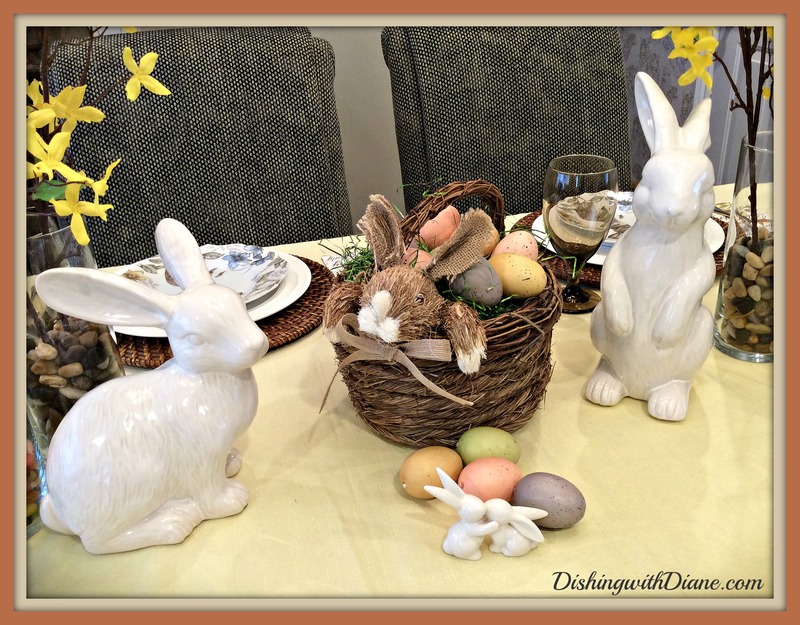 Now the matching vases and the bunnies on each side of the basket make the centerpiece complete. On the table this year is a new addition, and they are “Love Bunnies” from Pier I. They were just too cute to pass up. 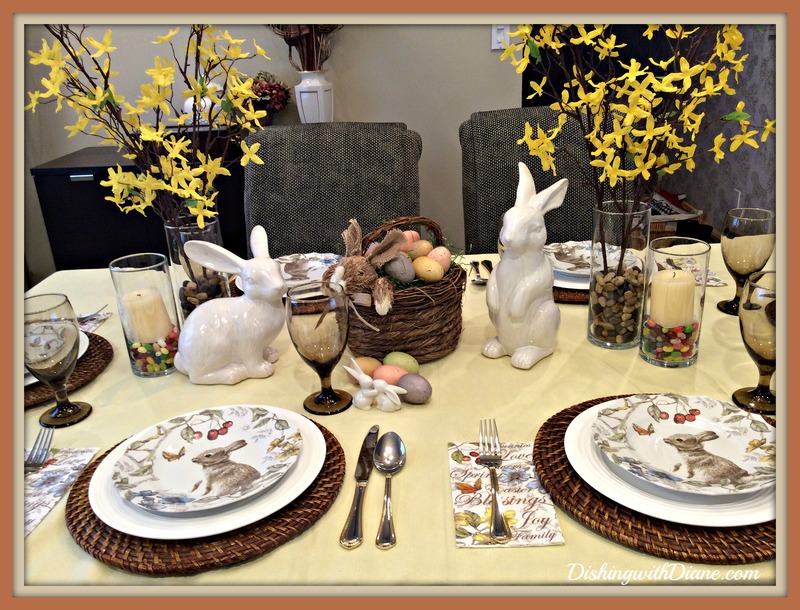 Thank you for letting me share my Easter Tablescape with you. 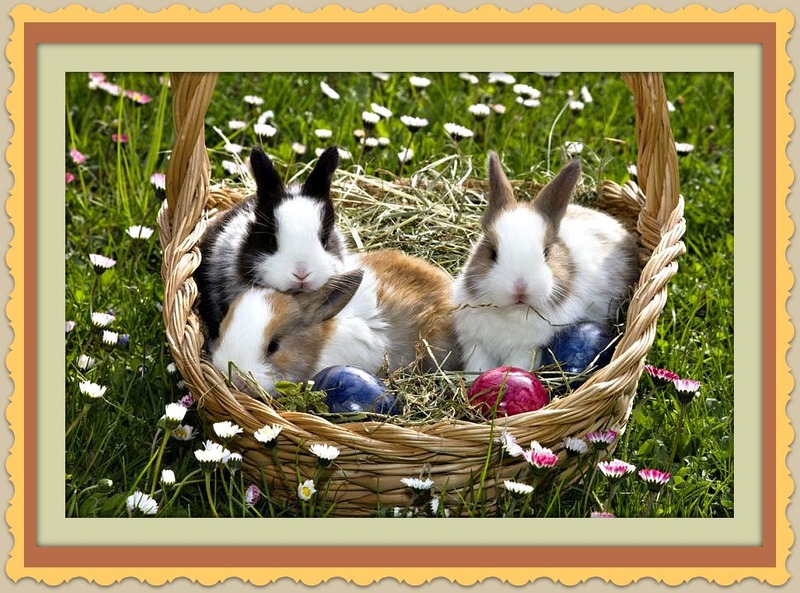 For those that celebrate this holiday, I wish you a very Happy Easter! 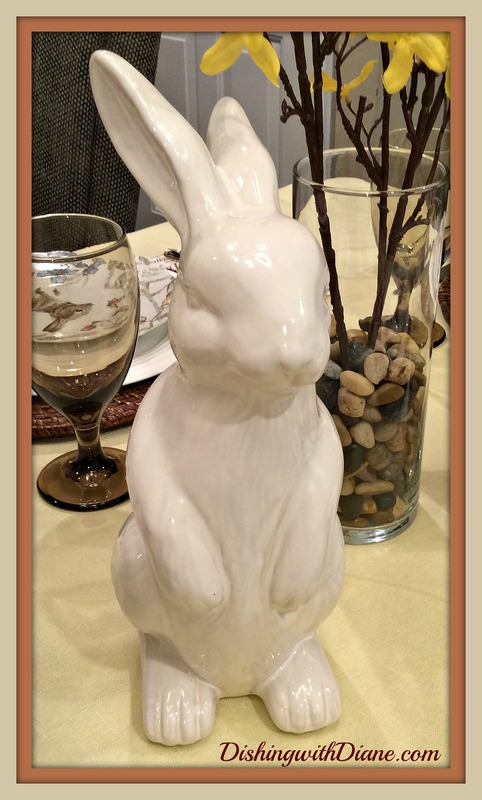 (To my friend, Jeanine Fisher, I hope you liked the bunnies and the tablescape. I know this is your favorite holiday). Until my next post, stay well and make every day a celebration! Thank you for visiting my blog. If you enjoy the posts, please spread the word, share the Facebook page on your timeline and ask your family and friends to follow. 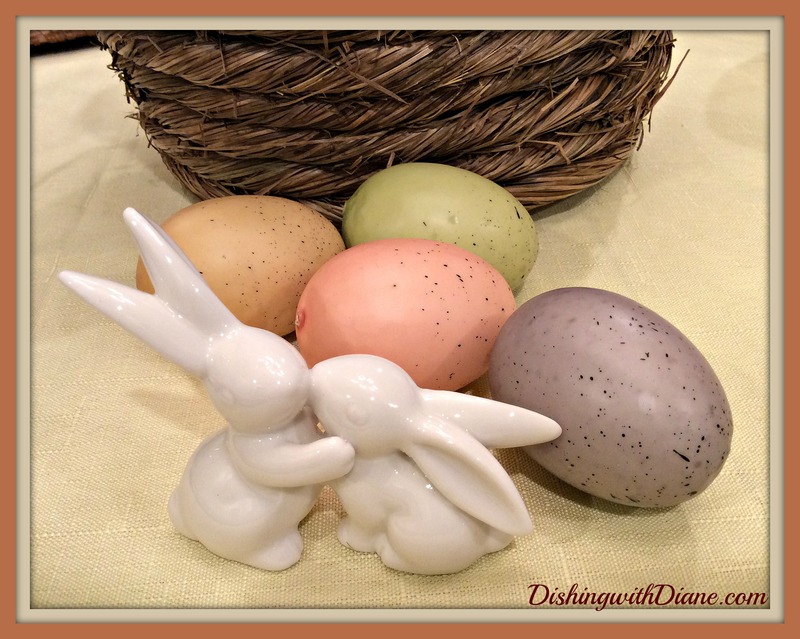 Before I start with the Easter recipes, there are a few additional Italian Easter culinary traditions that I feel are worth mentioning. (Sorry no recipes for them). The first is a traditional Italian Easter bread called, Colomba Di Pasqua. 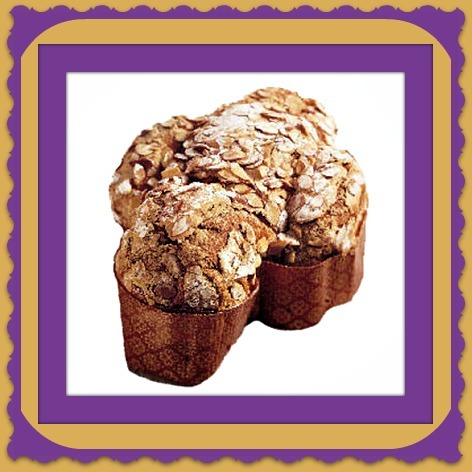 It is a yeast bread shaped like a dove (colomba in Italian), the symbol of peace and resurrection. It is similar to a Panettone and filled with raisins and candied orange peel. Topped off with almonds, sugar and a baked on almond icing to give it a sweet crust. We would eat Colomba for breakfast on Easter. 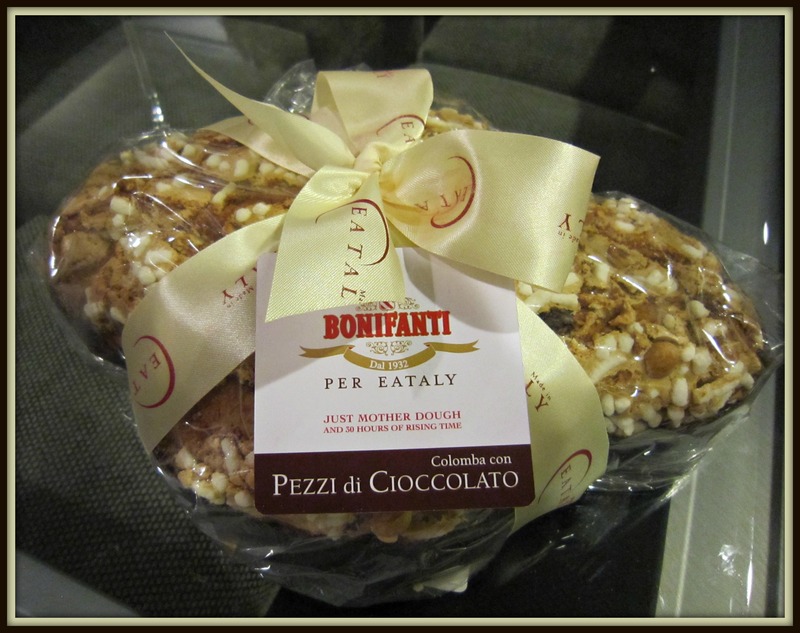 I personally love the Colomba Di Pasqua made by “Bonifanti”, it is the absolute best. They can be ordered online at Eataly. You will not be disappointed. (and they come in chocolate too). The next pie that is also a must at the Italian Easter dessert table is Pizza Grana (wheat pie). It is a cookie crust made with ricotta and whole grain wheat with orange, cinnamon, orange flower water and always has a lattice top. Delicious. 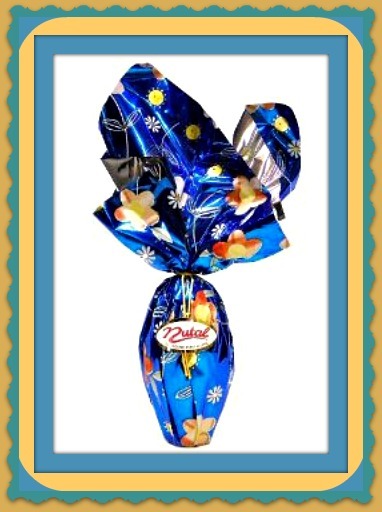 In addition to a chocolate bunny, every child in an Italian home waited for the Italian Easter egg. The egg is hollow but always filled with candy and a surprise inside. 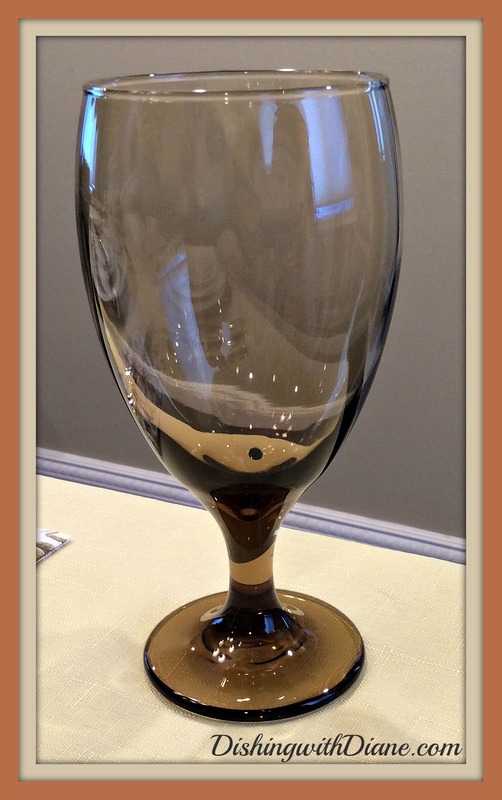 My mother would always put these at our place setting at dinner; and it killed us to wait for the entire meal to be over so we could finally open this chocolate egg for the surprise. This tradition of giving the Italian Easter egg is one I passed on to my son. When I see them displayed in stores during Easter time, I get a smile on my face and a rush of good happy memories of my childhood. 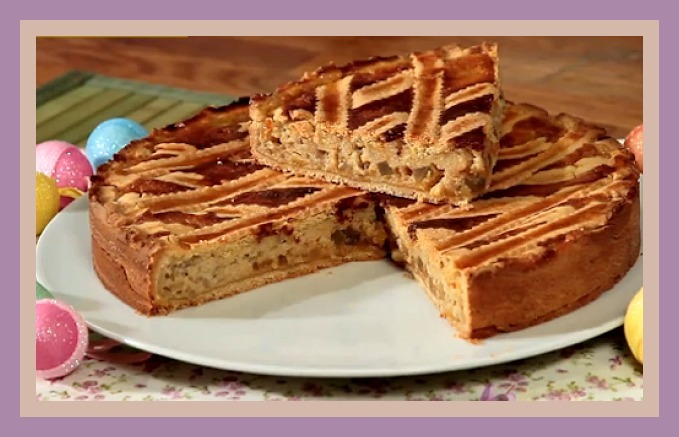 Torrone – I am sure you have all tasted Torrone at one time or another. Torrone is a nougat candy made with honey, whipped egg whites, vanilla and almonds. Torrone is available all year and I am sure you have seen it being sold by the chunk at every Italian Feast you have ever been to. But at Easter the Torrone were special. 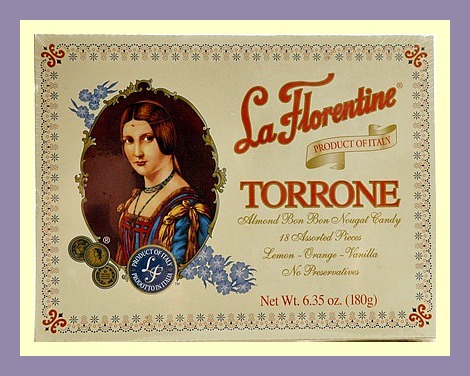 At Easter, the large box of Torrone contained 18 mini boxes of individual pieces of Torrone covered in a thin wafer, (the Ostia- which are just thin sheets of unleavened wheat bread). They came in lemon, orange and vanilla flavors and it was a project to decide what flavor you wanted. (My personal favorite was the lemon). I remember peeling off the thin wafer on top of the Torrone and eating that first; and then biting into the nougat. Eating Easter Torrone for a child was a special event; at least in my home. First of all, the word pizza in this case is not the pizza we know with red sauce and cheese. In this case “pizza” in Italian simply means pie. These are the photos from my pies from last Easter. They are not picture perfect but I didn’t make my pies for this year yet, but you’ll get the idea. For the first 30 minutes cover the pie with aluminum foil. If using a spring-form pan-let pie stand 15 minutes –then release pan sides and transfer to plate. Can be served warm or cold. Preheat oven to 350 F. generously butter and flour lamb mold. Beat butter, add sugar and extracts and beat until light and fluffy. Add flour with baking soda until well incorporated. Beat in eggs one at a time alternating with the sour cream until batter comes together. Pour batter into prepared face side of the lamb mold, facing down on a baking sheet. Fill to the rim wiping up the edges clean. Reinforce the ears by placing a toothpick horizontally in each ear. Carefully place lid on and bake for 1 hour, but check for doneness 10 minutes before. FYI, you will have leftover batter with this recipe, enough to make a small cake. For Decorating, make the frosting with the butter, powdered sugar, vanilla, half and half and a pinch of salt, mixing until you get a nice semi firm frosting. Add raisins for eyes, a cherry for nose and tie a ribbon around the neck. Cover platter with Easter grass and jellybeans. tip: the Easter eggs do not need to be hard-boiled. They cook when the bread bakes. I usually just dye the eggs raw without hard boiling them. Saves time. Just be careful they don’t crack! In a small saucepan, warm the milk and butter together, just till butter melts. In a large mixer bowl, combine yeast, salt, eggs and sugar. Add the warm (not hot – it will kill the yeast) milk and butter. Add about half the flour and beat until smooth with dough hook. Slowly add the remaining flour to form a stiff dough. Don’t worry about how much flour it ends up being, just keep adding until the dough is not sticky anymore. Knead until smooth with either dough hook attachment or turn out on floured board and knead. Place in a greased bowl, cover and let rise in a warm place until doubled, about an hour. Punch dough down, divide into 12 pieces. Roll each piece to form a 1 inch thick rope about 14 inches long and, taking two pieces, twist to form a “braid”, pinching the ends, and loop into a circle. Place on two baking sheets lined with parchment paper or Silpats. Cover and let rise until double, about an hour again. Brush each bread with beaten egg wash. Put on the sprinkles or pearl sugar. In the middle of each bread ring, gently place an Easter egg, making an indentation with the egg. Bake at 350 degrees until golden – about 20 minutes. Cool on rack. This entry was posted in Holiday Desserts, Holiday Tablescapes on March 29, 2015 by aries041158. Everything looks wonderful. Those bunny plates are adorable. You really outdid yourself. Another masterpiece! Very pretty tablescape. Love the bunny plates. Recipes look delicious. Outstanding job!!!! I love your Easter table. Thank you for mentioning me. Means so much. 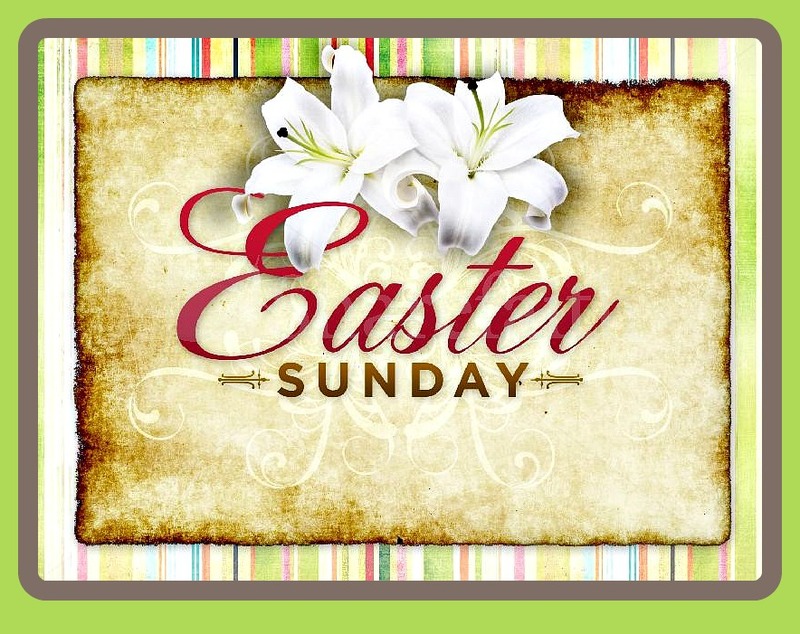 Have a blessed Easter.